As we wind down the week, I thought I’d share with you this twin set of embroidered Farmers Market bags, made by Melissa for her sister and her farmers market sidekick. I’m a sucker for farmers markets, especially in the fall! Here in the Midwest, we have an abundance of good ones that are heaps of fun to potter around early on a Saturday morning. But I don’t go to them in style. When I go, I pretty much crawl out of the house, looking pretty much like I just crawled out of bed. I don’t have embroidered totes to tote around my stuff, like these two adorable bags. I think they’re a great idea, and I thought they’d serve as inspiration for other FM enthusiasts out there! Melissa used vintage embroidery patterns for the designs on the totes. 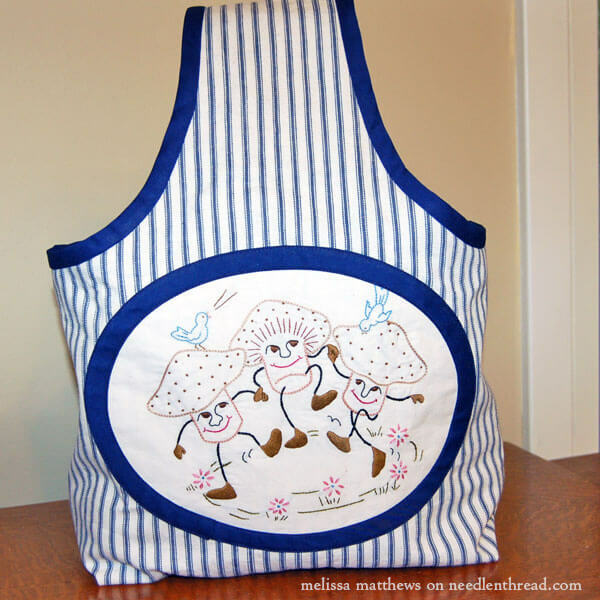 You can find this dancing mushroom embroidery design right here on Flickr, posted by Keen Olive. I especially like the finish work on these bags. The embroidery looks so neat and tidy, and perfectly fixed to the front of each bag. 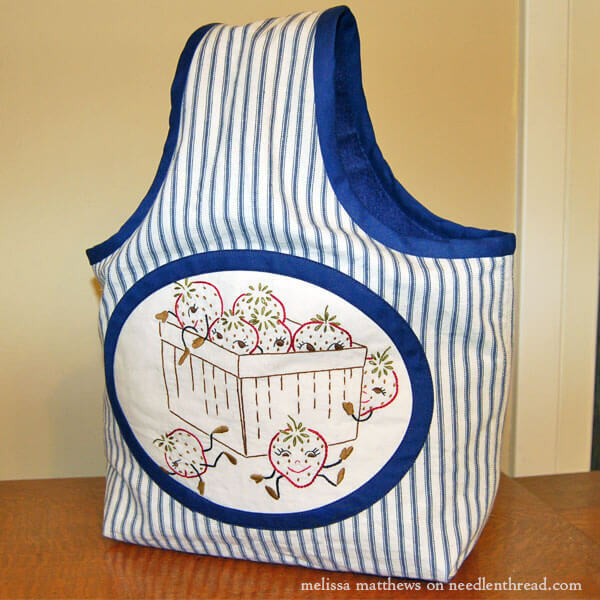 The second bag features another vintage design of coquettish little strawberries hanging around their basket. You can the vintage strawberry design on Flickr, too. I didn’t get a run-down on the stitches used in the project, but looking at the photos closely, it looks like there’s a bit of chain stitch, stem stitch, daisy stitch, French knots, and satin stitch. Aren’t the bags too cute? They kind of make you want to hit the farmers market this weekend, don’t they? And you know, I may have to do just that! It would be a good escape from thread organizing – and I’m all out of honey. Two very good excuses. I hope you get a chance to indulge in some quality time with your needle and thread this weekend and that you have a Wonderful Weekend all around! See you Monday! What a great idea to decorate shopping bags they are certainly more exciting then supermarket advert plastic carrier bags. I really like the design especially the strawberries. Well done Melissa I’m sure you love shopping now with these decorative vintage patterned bags. Thanks for sharing these decorative bags with us Mary a great idea and so pretty and they certainly make you want to go out shopping. I hope you have a great weekend with lots stitching or floss organising. Oh, I wish I could sew! I’d made a variety of these for all the ladies in my family. They would love them. The embroidery part I could do, but not the bag. Those are very cute, Mary. Thanks for sharing. Happy shopping! Those totes are super cute. Love the vintage patterns. Well done Melissa! I’m off to farmers market this weekend myself. Hoping to find enough pickle cucumbers to make a couple batches of bread & butter pickles for Christmas presents. Maybe I’ll even get in a little stitching on the Christmas ornaments. Thanks for sharing these with us Mary and have a great weekend! I’m Marsha’s “farmers market friend” and I love the bag Melissa made for me. It’s vintage style is adorable. Previous Previous post: Organizing Lots of Thread for Big Projects – How do You do it? Next Next post: Thread Organizing for a Large Needlework Project – All Done!